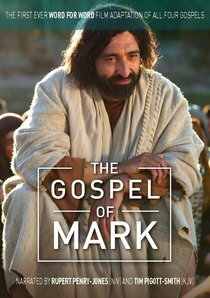 :The Gospel of Mark filmed by The Lumo Project which brings the original Jesus narrative to the screen using the Gospel text as its script, word for word. Informed by leading world experts' latest theological, historical and archaeological research on every aspect of life in first century Palestine, this is a ground breaking multi-million pound film series that revolutionises the way we experience and understand the story of Jesus. Based entirely on the unedited, unabridged New Testament Gospels, its dramatised action is accompanied by voice over narration by Tim Piggott Smith and Rupert Penry Jones. Filmed with authentic actors and settings, the perfect Holy Land backdrop, including computer generated Jerusalem and Temple. Winner of UK Christian Film Festival Awards 2015: Best Series and Best of British. About "The Gospel of Mark: The First Ever Word For Word Film Adaptation of All Four Gospels"